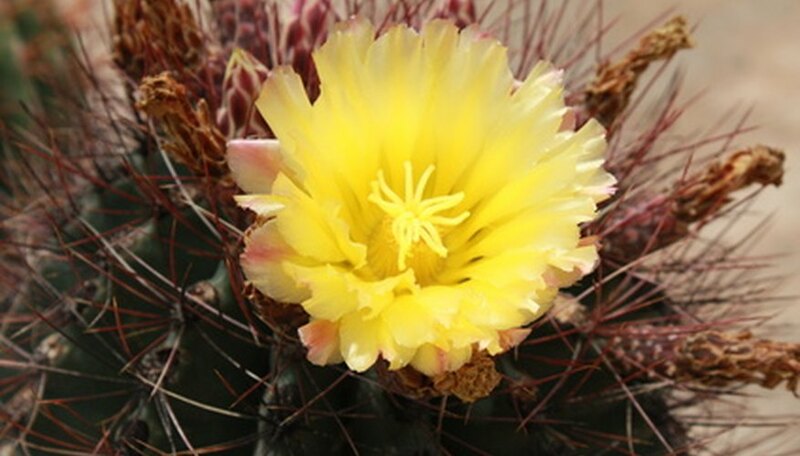 Yellow flowering cacti are more commonly called Emory’s barrel cactus. These large flowering cacti grow well in dry soils in the Mojave, Sonoran and Chihuahuan deserts, and are found ranging from Texas to California. They can reach 10 feet tall but average 5 feet in height and up to 30 inches in diameter. They bloom a bright flower reaching 1 ½ to 2 ½ inches in diameter from April through June. The Emory’s barrel cacti is a hardy succulent that requires little care once planted. Plant the cactus in a desert soil with good drainage. Most nurseries will notch the potting container to alert gardeners to the correct southern facing side. Position the plant so that the notched edge of the container is facing the south. The cactus grows towards the south sun to avoid sunburn and must be positioned in this manner. Dig a hole in dry soil as deep as the original container and 12 inches wide, if you're planting the cactus in the ground. Place the cactus in the hole and backfill with soil. If you're planting the cactus in a pot, fill a large planter with a soil mixture for a cactus or succulent. Combine 2 parts sharp sand, 2 parts loam, 1 part soft broken brick, ½ part leaf mold, 1 qt. ground limestone and 1 qt. bone meal in the planter. Mix well. Dig a hole in the center of the planter, and position the cactus into the hole. Back fill with remaining soil to cover the root system of the cactus. Firm the soil around the base of the cactus. Water the cacti generously after you plant it. Allow the soil to dry between watering. Provide water to the cacti when the trunk appears shriveled from lack of water. Apply water generously, and allow the drying process to occur again. Wear heavy leather gloves when handling cacti.